According to an announcement in the Edwardsville Intelligencer, the Craftsman bungalow at 1211 Emerson Ave. was built for Edward and Emilie Klausing in 1924. The home was then in the Village of Leclaire, which is now the Leclaire National Historic District of Edwardsville. Edward Klausing grew up on a farm in Pin Oak Township. Born Feb. 28, 1886, he was one of six children born to German immigrant parents. Edward’s first wife, Anna Bress Klausin, died in November 1918, during the height of the influenza epidemic in Madison County. When Anna died, she left two young children, Helen, 5, and William, 2. Edward was a farmer and had no way to care for the children so they were taken in by Edward’s sister and her husband, Minnie and Adam Flath, Jr. The children would remain with their aunt and uncle until they were grown, never returning to their father’s house. In December 1921, Edward married a widow, the former Emelia Kuhlman. 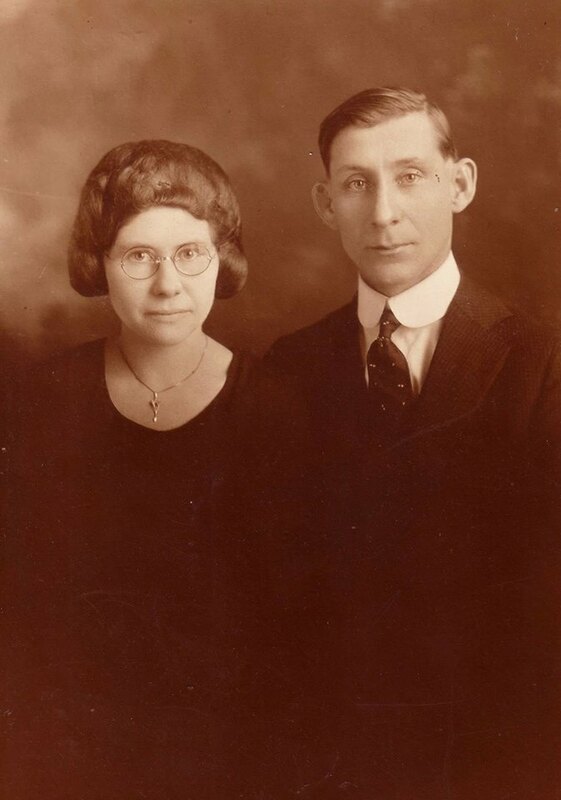 Emelia was born March 1, 1892, and, like Edward, grew up in Pin Oak Township. Her parents were second generation German farmers. When Emelia’s first husband, Louis Wille, died in January 1917, she was left to raise their two young girls alone. Fortunately, Emelia and her daughters, Irma, 6, and Olga, 4, were able to move in with her parents. Emelia brought her children with her to the marriage so in 1924 their blended family, Edward, Emelia, Emelia’s daughters and baby Rose, born in May 1924, moved into the new house on Emerson Avenue. Unfortunately, the family would not live there long. During the Great Depression, like many others in Madison County, Edward was unable to obtain a steady job. They took out several mortgages on the house, but were unable to pay them back. Before the house could be taken by the bank, Edward’s nephew, John Niemeier, bought the house and the debt in 1933. John was fortunate to have a steady job at the railroad yards and was a farmer as well. Edward and Emelia moved to McKinley Avenue where they rented a house for many years. John Niemeier’s parents lived on Troy Road and his soon to be wife, Rose Rinkel, lived with her parents at 1107 Lake Avenue. John purchased the Emerson Avenue house in April 1933, just a few months prior to his marriage to Ella Rinkel. Although it was the middle of the Depression, the Niemeiers escaped the financial problems experienced by many of their neighbors. John worked for the Illinois Terminal Railroad for 40 years, and his wife worked as a stenographer for the N. O. Nelson Manufacturing Company for many years. The couple never had children. The Niemeiers occupied the Emerson Avenue house until the early 1950s when they moved to the home of Ella’s parents at 1107 Lake Ave. The house on Emerson was rented to family members who were very familiar with the house. Irma Wille Dustman had spent part of her childhood in the house. She was the step-daughter of Edward Klausing, John’s uncle, so was a cousin by marriage to John Niemeier. Irma and her husband, John Dustman, purchased the house by contract for deed in 1958. John and Irma Dustman owned the house until 1995 when it was sold to a neighbor, George Edwards, who then used it as a rental property, all the while continuing to maintain and improve the property.